New research pinpoints to certain mutations that may have helped the stickleback, a tiny armored fish, to evolve quickly between saltwater and freshwater forms. Since the end of the last ice age, about 10,000 years ago, the ocean-dwelling three-spined sticklebacks (Gasterosteus aculeatus) have repeatedly colonized freshwater streams and lakes. In the last ten generations, marine sticklebacks have managed to swap their armored plates and defensive spines for a form that’s smoother for freshwater. Sticklebacks are part of the family Gasterosteidae, which currently has sixteen different species grouped in five genera. Several of these species have recognized subspecies. David Kingsley, an evolutionary biologist at Stanford University in California, and his team have identified the DNA differences that distinguish ocean and freshwater sticklebacks. While this change change seems to have occurred on multiple occasions in the past, it always involves the same genes. In order to trace these DNA differences, the researchers sequenced the entire genetic code of 21 sticklebacks from ocean and freshwater sources, found on three continents. They published their results in the journal Nature. Over most of the genomes, freshwater sticklebacks were most similar to their saltwater counterparts, but in 150 DNA sequences, freshwater and saltwater populations were each more like their cousins in the same environments. The affected sequences include the genes affecting armor growth and salt processing in kidneys. These similarities imply that the fish do not evolve new features from scratch, but retain ancient genetic adaptations that are reactivated in new environments. Whole sets of regions of genomes are being used over and over to adjust to new environments. 80% of the freshwater adaptations were situated in regulatory DNA while the remaining 20% affected coding DNA. This could mean that the stickleback’s adaptation is sped up by controlling the gene expression in multiple tissues with each mutation. 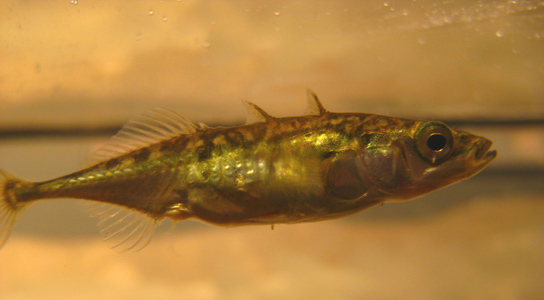 The study also shows that stickleback evolution is accelerated by the use of pre-existing genes instead of waiting for new, random mutations to arise. Be the first to comment on "Stickleback Fish Used Pre-Existing Genes to Go from Saltwater to Freshwater Environments"